Winter travel can be stressful with the concern of weather-related delays and cancellations. On a recent trip that had a connecting flight, I was notified the night before that my first flight was going to be delayed, which made me worry about missing my connection. I called the airlines and they suggested changing my connecting flight to a later one, which I was happy to do. Even though the flight was later, I would still arrive in time for my meeting. The customer service agent was happy to accommodate my request. Then I started to think. She rebooked me on the later flight. I wondered if there was an earlier flight from my home airport that would allow me to keep my original connecting flight. Sure enough, there was. I called the airline back and, once again, they were happy to accommodate my request. Here's the point of the story. I shouldn't have had to call back. The agent should have offered me the option of leaving on the earlier flight. She was very nice and willing to help. But she didn't look past the obvious, which was to check on a later flight. Given that I called hours before the flight, she might have looked at the earlier flight, which was actually a better option. This may sound like I'm criticizing her and I guess, in a way, I am. But, not about the way she treated me. She was a model customer service agent; friendly and helpful. However, the reality is that she should have thought to give me the option of taking the earlier flight. Proper training and coaching could have helped. I'm sure that if I had suggested looking at earlier flights she would have said, "Good idea." How many times do we find a solution to a problem and stop considering other options, potentially missing a better solution? After the fact you think, "Darn, I should have thought of that!" One way to come up with an alternative solution is to think about the opposite. In our airline example, what would have happened if the agent asked herself, "What's the opposite of being switched to a later flight?" The answer, of course, is an earlier flight. Then check to see if there is one. 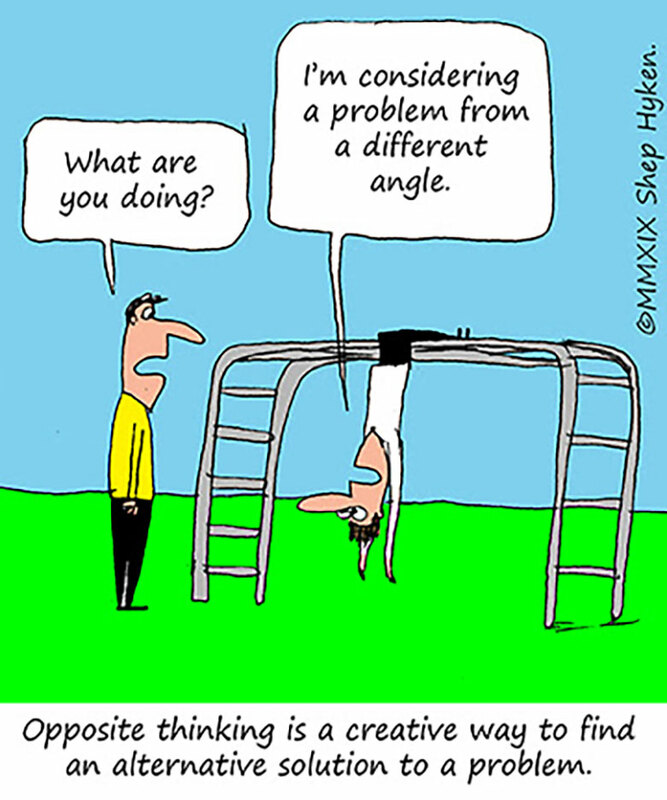 Opposite thinking is just one way to get into creative problem solving. There are many others. The point is that if you're working with a customer and trying to resolve a problem, consider all potential solutions, not just the first one you come up with. Even if the first one you think of turns out to be the best solution, you would know that you gave yourself and the customer other options to consider.